I now start considering a selection of American painters who were happy to be branded Impressionists. 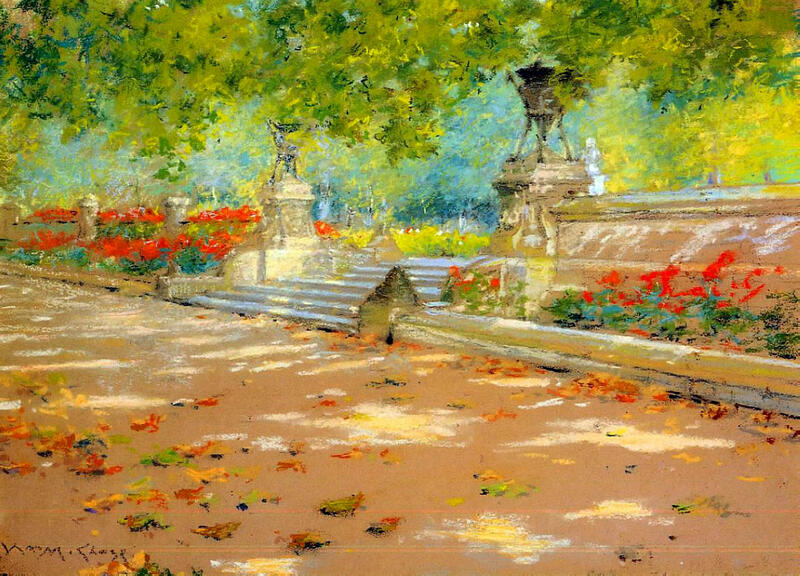 As always, I am limited to those artists for whom I can find sufficient images of suitable quality for use here; if I omit one of your favourite American Impressionists, please let me know, preferably providing a link or two to sites where there are freely usable images. Born in Williamsburg (now known as Nineveh), Indiana, in 1849, his family moved to Indianapolis in 1861, where he worked in the family business. He studied under local artists, then in 1869 went to New York for further study, enrolling in the National Academy of Design there. However he had to leave New York and return home to St Louis, Missouri, where he worked to support his family and made a reputation for himself in the local art community. 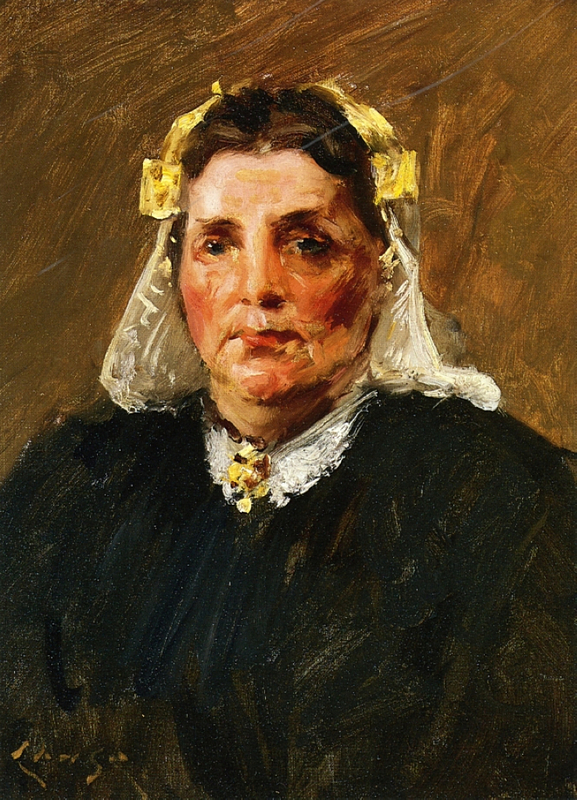 He exhibited his first painting at the National Academy in 1871, and this helped him secure local patronage to study in Europe. 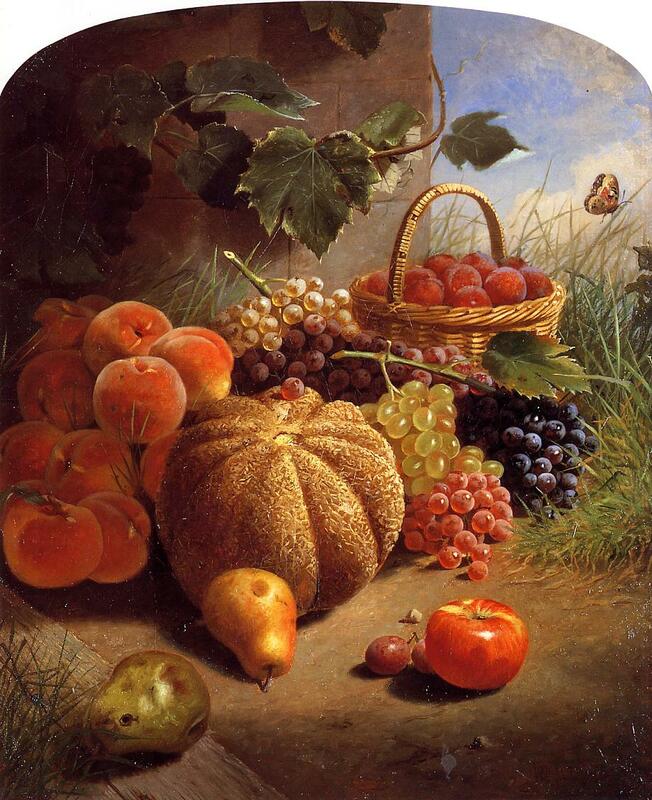 At this time he was painting in a strict realist style, and completed several fine still lifes and other works. William Merritt Chase, Still Life with Fruit (1871), oil on canvas, 77.47 x 63.5 cm, Parrish Art Museum, Water Mill, NY. WikiArt. He moved to Europe in 1872, and although he found Paris beguiling, decided not to stay there because of its many distractions. He instead enrolled at the Royal Academy of Fine Arts in Munich, alongside several other American students. His style loosened up a great deal and became more impressionist. 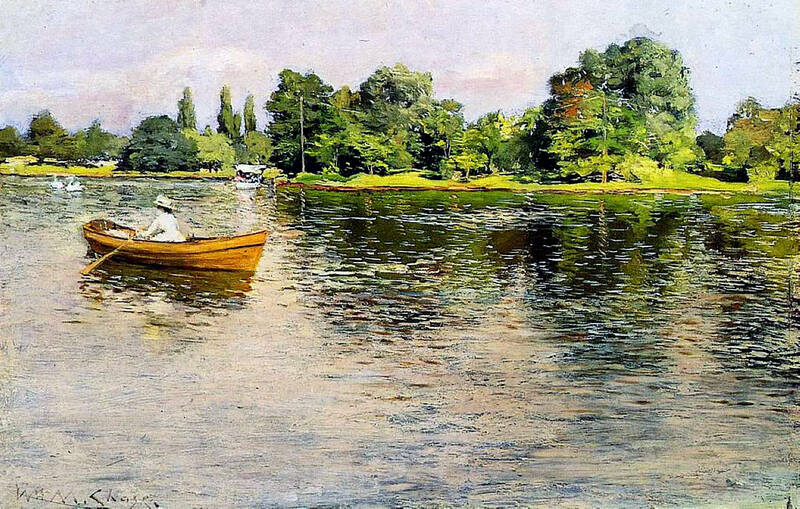 He had a painting exhibited at the Boston Art Club in 1876, which went on to win him a medal at the Philadelphia Centennial Exposition, and started to build his reputation. 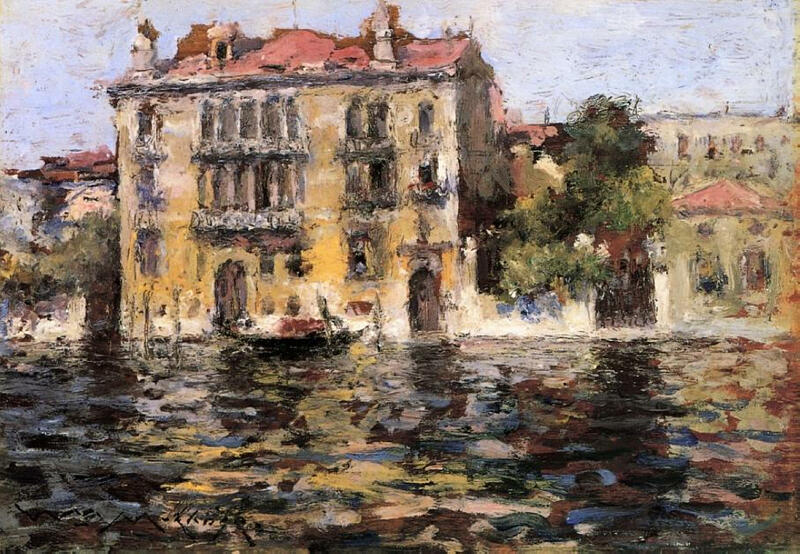 In 1877 he travelled to Venice with Frank Duveneck (a fellow student in Munich) and John Henry Twachtman, returning to the US in 1879, when he opened his studio (formerly that of Albert Bierstadt) in New York. He made friends with Winslow Homer and other leading artists there. His increasing recognition allowed him to live a sophisticated but never lavish lifestyle. 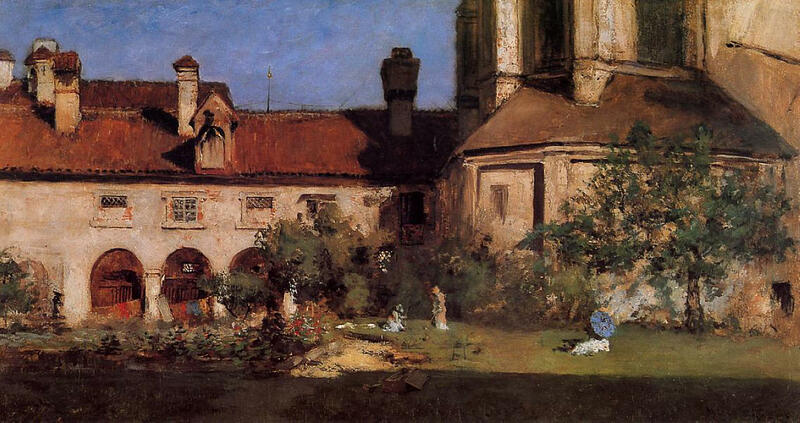 William Merritt Chase, The Cloisters (c 1880), oil on canvas, 61.28 x 91.44 cm, location not known. WikiArt. In 1881 he toured Europe again, visiting Italy, Capri, and Germany, then went to Spain the following year. 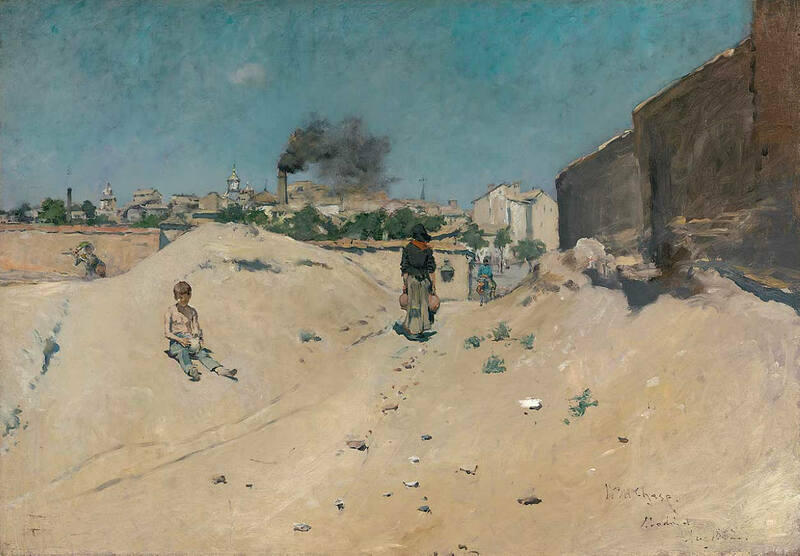 Although he had a voracious appetite for studying and copying the works of other painters, he developed a particular liking for those of Corot, and the Hague School (a Dutch parallel of the Barbizon School in France). His own style now shunned the conventions of the Salon, and he used lively and at times aggressive paint handling to bring his portraits and other work to life. This received critical endorsement. 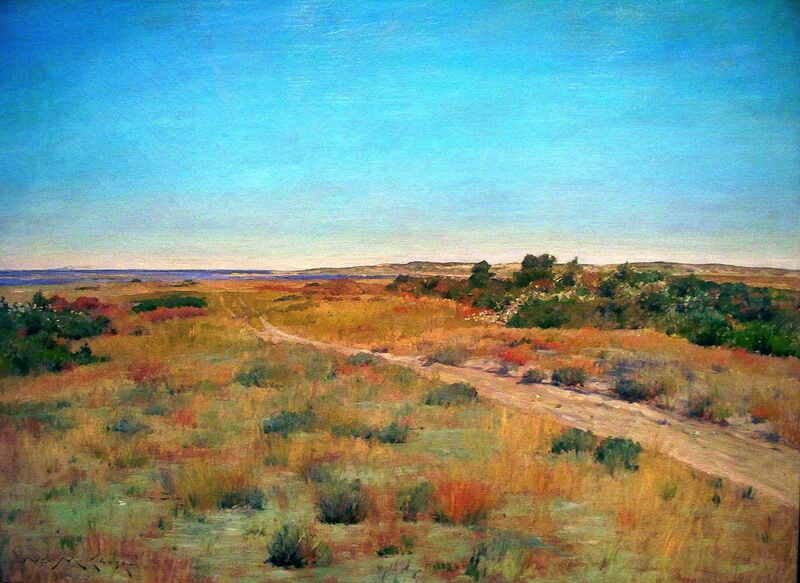 William Merritt Chase, The Outskirts of Madrid (1882), oil on canvas, 81.28 x 114.94 cm, Yale University Art Gallery, New Haven, CT. WikiArt. 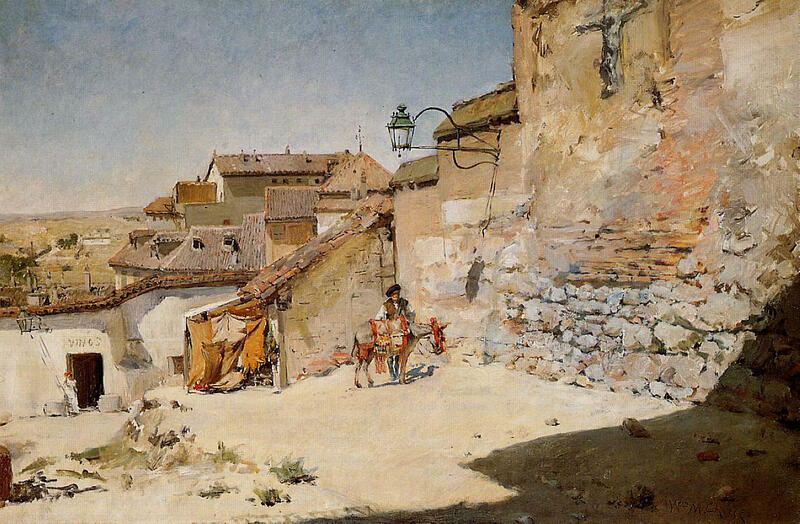 William Merritt Chase, Sunny Spain (1882), oil on canvas, 49.5 x 74.3 cm, Private collection. WikiArt. 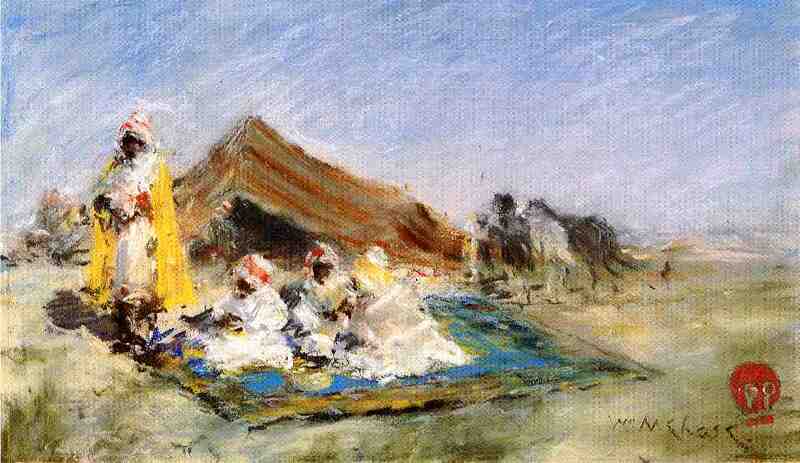 William Merritt Chase, Arab Encampment (1883), pastel, 19.69 x 34.29 cm, Private collection. WikiArt. In 1883, he exhibited a portrait at the Paris Salon, alongside paintings by Whistler and John Singer Sargent. From 1885-95 he was president of the Society of American Artists. 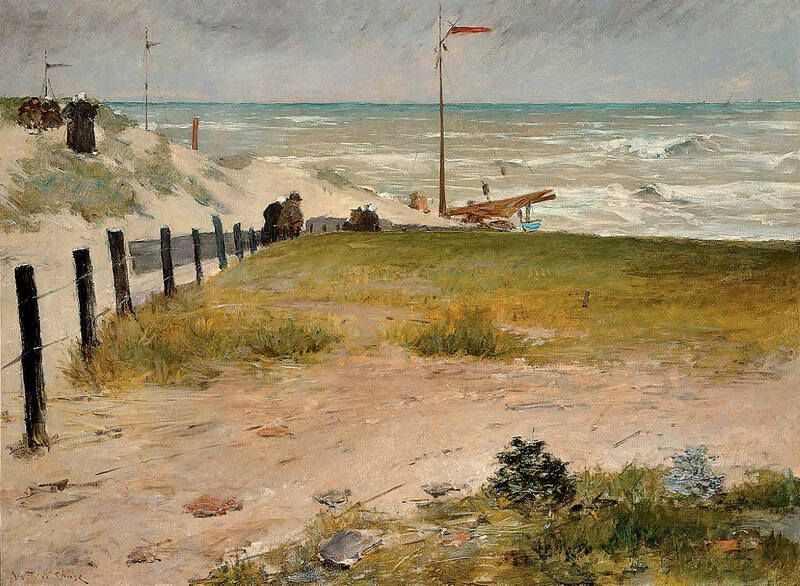 From about 1886 he started to paint landscapes with even greater devotion, often working plein air. His main motifs were found in Prospect and Central Parks, New York, and later around his family’s summer residence at Shinnecock, Long Island. He taught extensively for most of the later part of his career. He opened the Shinnecock Hill Summer School on eastern Long Island in 1891, teaching there each year until 1902. 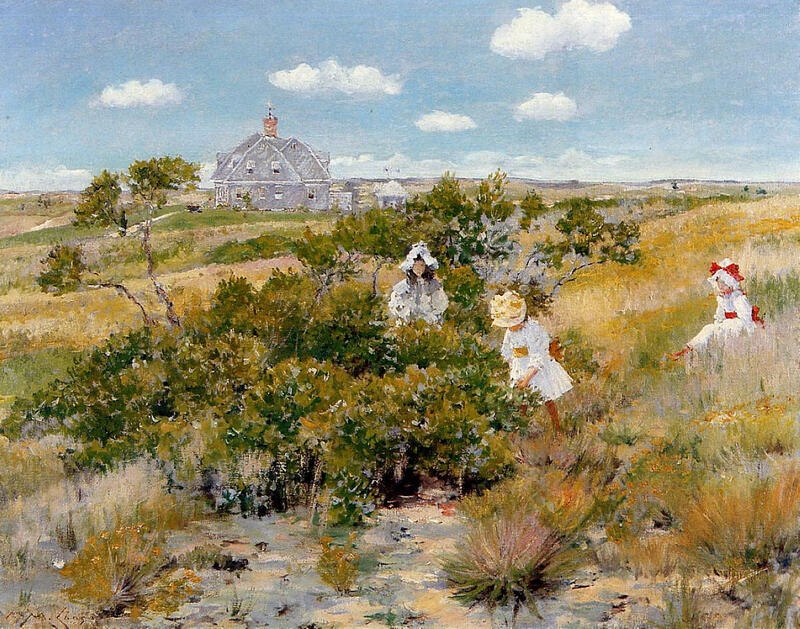 From 1892, his family spent much of the summer in their house in the newly developed area of the Shinnecock Hills. In 1896 he opened the Chase School of Art, which became the New York School of Art in 1898, and he taught there until 1907. Among his most famous pupils were Georgia O’Keeffe (1887-1986) in 1907, and Edward Hopper (1882-1967). 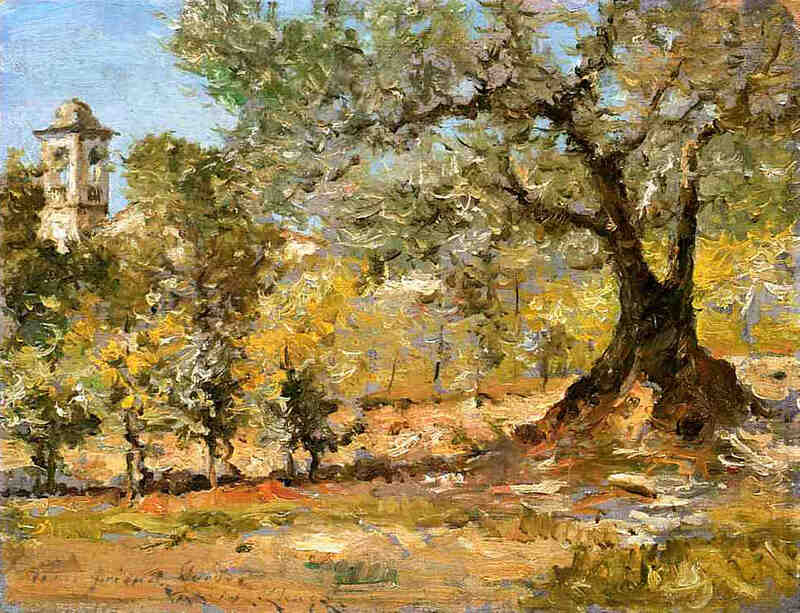 He still found time to travel, and led summer painting schools to Europe from 1903 onwards. These visited the Netherlands, and he eventually bought a property near Florence. Shortly before he became terminally ill, he taught for a summer in California in 1914. He died in 1916. 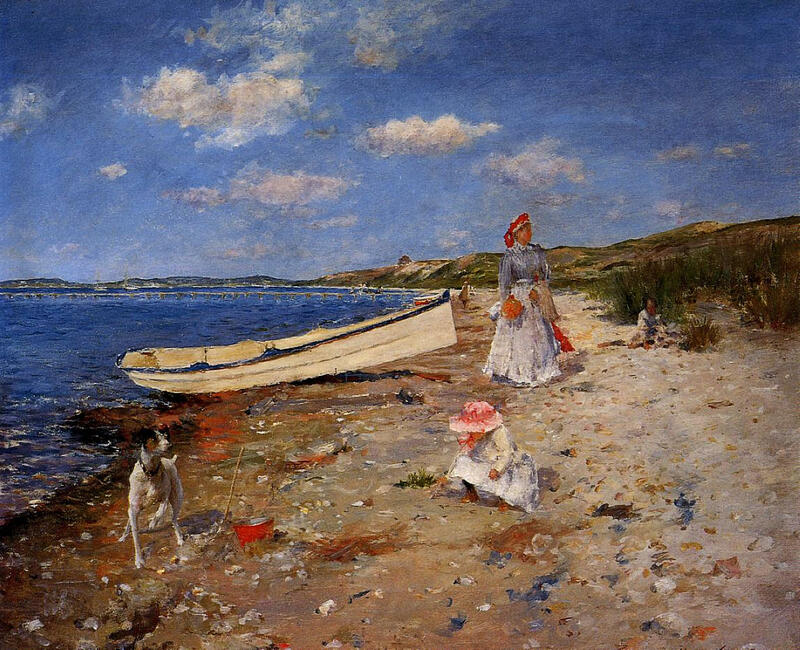 William Merritt Chase became an unabashed Impressionist during his long training in Europe, and from about 1880 onwards most of his paintings are characterised by loose brushwork and other characteristics of full Impressionist style. 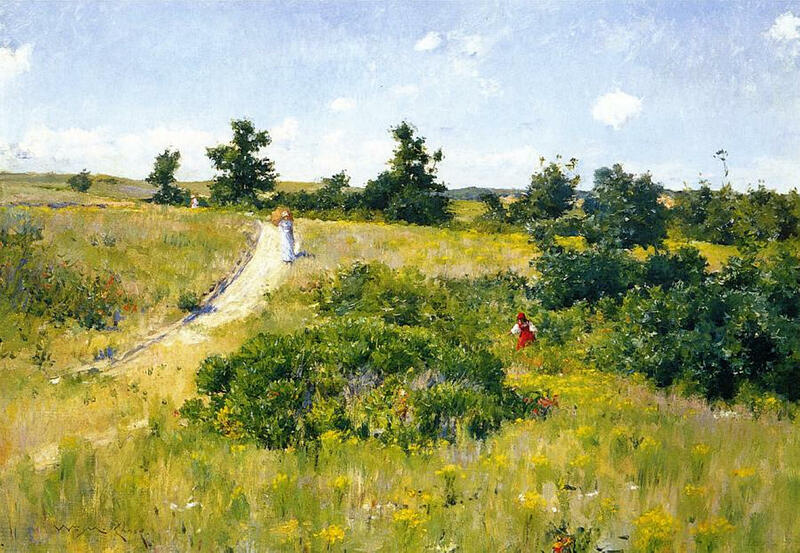 Although he initially concentrated on portraiture, his many summers in the Shinnecock Hills provided perfect conditions for him to paint superb plein air landscapes. 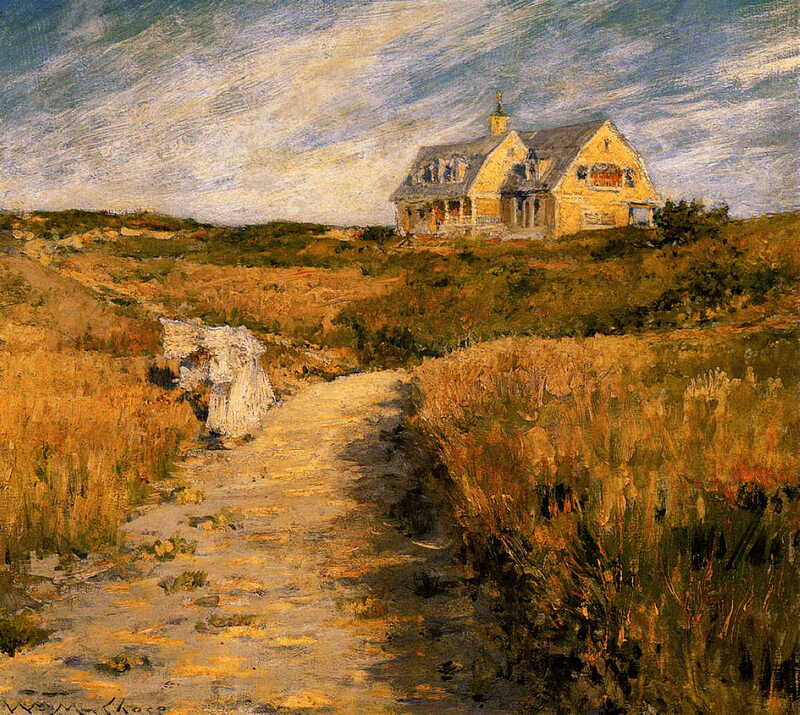 He was without doubt a leading American Impressionist, and a great painter by any standards. Biography and works by Katharine Metcalf Roof, 1917. Still a valued and contemporary record. Longwell AG (2014) William Merritt Chase. A Life in Art, Parrish Art Museum and D Giles. ISBN 978 1 907804 43 4. Posted in Painting and tagged Chase, Corot, Hague School, Homer, Hopper, Impressionism, O'Keeffe, painting, Sargent, Shinnecock, Twachtman, USA, Whistler. Bookmark the permalink.